Slaying a rampaging rathalos with a team of friends is one of Monster Hunter: World’s greatest joys—if you can sort through the menus required to join your pals. The game’s online management is clumsy and poorly explained. Setting up online sessions and sharing codes can be confusing, but it helps you get the precise experience you want while hunting. 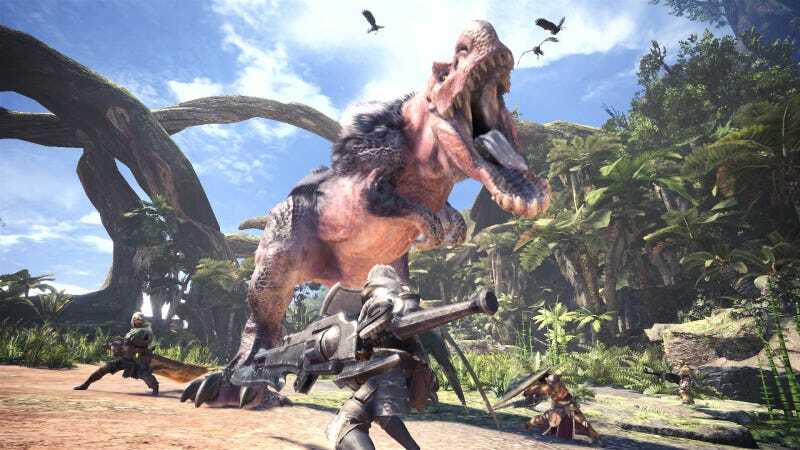 Joining an online hunt in Monster Hunter World isn’t as easy as hitting the play button and waiting a few seconds. If there’s one major thing the game gets wrong, it’s how needlessly complicated matchmaking is. To play with your friends, you have to speak to the in-game Handler or go to the Gathering Hall’s quest counter to manually search for online sessions that fit the criteria you want. You can browse search terms such as language or the monster you want to hunt. To head to a specific session, you need a ten digit session ID composed of random characters. Monster Hunter: World doesn’t really explain the procedures and rules that go into joining a multiplayer match. There is a matchmaking tool that will automatically drop the player into a random session. If you’re looking to play with friends or members of your squad (basically the game’s version of guilds,) you can invite them to your session through an option in the pause menu. If that doesn’t work, you’ll need to know either your session ID or your friend’s, which can be found by checking the Player List option in your menu. Once you know the ID, you can join your friend or invite them to join you. Browsing search terms or typing in session IDs feels complicated, but these extra steps help you find the kind of match you want to play. If you’re looking for Anjanath material farming, you can search for it in the menus. If you want to search for a session full of hunters near your rank, you can do that. Monster Hunter: World’s menus slow down the matchmaking process, but they give players the ability to find the precise hunt they want. The best way to learn these tools is to use them. Try searching your browser for certain monsters or get a small group of friends together into a single session. Like anything in Monster Hunter: World, it’s much scarier to look at than to deal with. It’s worth learning to navigate the complicated session finding process to find the hunts you’re eager to complete. Meanwhile, setting search terms or passwords on a session you create can help turn them into small community hubs. A well-populated online session feels a bit like an old Team Fortress 2 server: full of people people looking for a good time and eager to show off their gear. Sessions can function like miniature communities if you gather enough friends. I’ve tweeted out session IDs to Kotaku readers during livestreams, and the result has been a small gaggle of hunters aiding each other with quests. Supplementing the online session system with tools like Discord can lead to enthusiastic sessions of like-minded players and great hunts.